When you hear the word “casserole” it conjures up images – red and white cans, pyrex dishes, 1950’s housewives. Faith Durand, in her new book, Not Your Mother’s Casseroles , sets out to bring the casserole into the modern age. I am a huge fan of another book in the series, Not Your Mother’s Slow Cooker Cookbook , and so when I was offered a copy of Not Your Mother’s Casseroles to review, I welcomed the opportunity. This is definitely a fresher take on the casserole — no recipe calls for Campbell’s soup, and Durand definitely cuts down on the gooey, cheese and fat filled casseroles of yore. Because of this, the definition of casserole was EXTREMELY loose and seemed at times to encompass any dish that is baked in the oven for any length of time — I’ll buy baked oatmeal as a casserole, but the cheesy bread bites (bread cubes tossed with sour cream, shredded cheese and scallions, then baked on a cookie sheet), although delicious, were stretching it. You might as well call chocolate chip cookies a casserole. Still, the book abounds with lots of one dish, healthful meals, most of which feed a crowd and reheat well. Durand, who is an editor of ApartmentTherapy’s TheKitchn.com, was very clued into the world of food blogs and the recipe resources they present, which offered a nice change from so many cookbooks I read today, which seem to exist in a bubble with no Wifi. I had no difficulty finding plenty of recipes to try, and there are many more I marked as interesting. As for the recipes themselves, I hit highs and lows. The Prune and Ricotta Breakfast pudding was only OK at Sunday breakfast when served warm, but ended up being a surprisingly great option when eaten cold on rushed mornings for the rest of the week (The recipe serves WAY more than 4, though – the three of us barely made a dent in it for Sunday breakfast, and I would say it easily feeds 8 and could stretch to 10). The Mushroom Casserole with Cheese and Onions was a little bland and the texture was dull — I think I would have enjoyed it more with brown rice in its original incarnation on 101 Cookbooks I didn’t love the Smoked Sausage and Sage Pasta Casserole (it was a bit of a cultural mishmosh, with andouille sausage, sage and mozzarella cheese), but it had a lot going for it — it was relatively healthy, my family gobbled it up, and the leftovers were a great brown bag lunch. 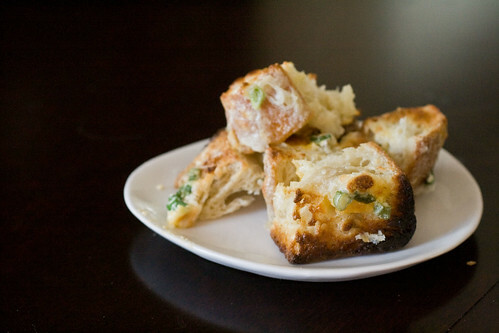 The cheesy bread cubes mentioned above, however, were fantastic and super easy. I will say that I thought a lot of the recipes were a little heavy on the prep or cooking time. Most of this book’s audience are probably time-strapped parents who are feeding families, and it would have been nice to see a section on casseroles that come together particularly quickly for those modern age working mothers. Still, the book did tell you which casseroles could be prepared in advance at cooked at the last minute, and most casseroles in general have the virtue of reheating well. Overall, I would say this is a solid effort, and it provides a lot of creative ideas for feeding your family out of the oven. The recipes are interesting, and with a little tweaking, very good. If you’re a fan of casseroles but would like to see lighter, more modern versions, this is the book for you. If you’re looking for super speedy dinners, or you’ve never met a can of Cream of Mushroom Soup you didn’t love, look elsewhere. Preheat oven to 325. Lightly grease a 6X10 baking dish with nonstick spray. Pour 1 cup of boiling water over the prunes in a bowl. In another large bowl, pour the remaining 2 cups boiling water over the oats. In a (third) large bowl, beat the eggs until frothy. Add in ricotta, milk, sugar, brandy, vanilla, cinnamon, nutmeg and salt. Beat until smooth and combined. Drain the oatmeal and the prunes, and stir both into the ricotta mixture. Pour into the baking dish. (At this point the dish can be covered and refrigerated for up to one day). Dust the top with ground cinnamon, place in the oven, and bake, uncovered for 50-55 minutes, or until there is no more wobble. 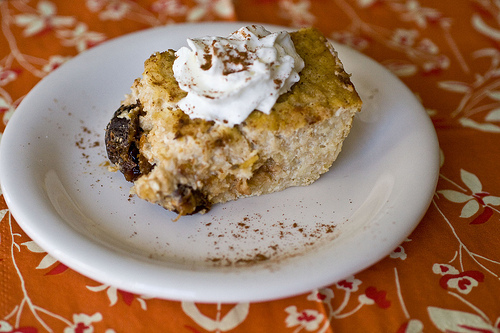 Serve with whipped cream and cinnamon sugar. So glad you are back and seem to be feeling a little better.. I can’t wait for spring out here and my garden and all the lovely things that go along with summer! We had over a foot of snow this weekend, but I’m trying to look on the bright side: more nitrogen to help grow plants….